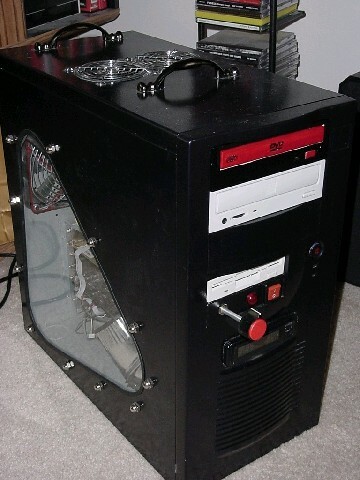 I have noticed one thing about case modding, it is a disease, not just a hobby. 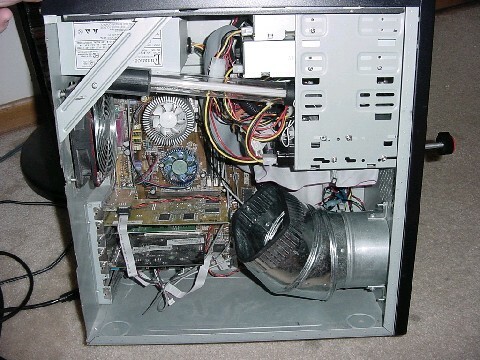 As soon as my friend installed high wattage server fans on his case, it became my mission to beat him in the world of air-cooling. 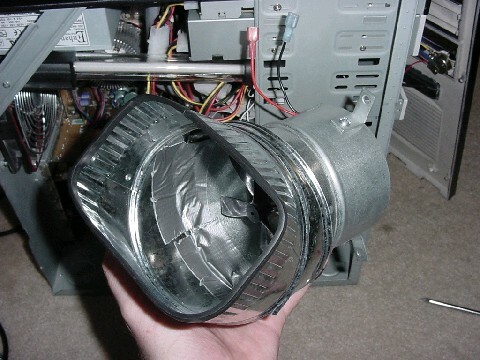 This seems to be very popular with LAN Party and OC'ers. After finishing my project I wanted to share the know-how with the rest of the nut-bar people so they can build one themselves. This is my gaming rig. I got a new burner the same time my floppy drive blew up so I have not had time to paint them. Yeah, I know it looks stupid but this will be my next project. My goal was to build something that was a little more powerful than your typical 120mm case fan. So I built a fan system using one of those 9-18 Volt copper coil engines you can buy at any hobby store. I used two engine props instead of a fan blade because I simply could not find one small enough that could take the high speeds! The outer casing was fashioned from building ductwork that you can find at any hardware store. After finishing it I realized, (And so did my wife!!!) that it was a little bit of an overkill! (Air flow measured at 60.445 CFM!) So, I needed some sort of circuitry so I can regulate the speed at which this thing blows! This is also important because the engine will pull 32 Watts at full speed. So make sure your power supply can take it. 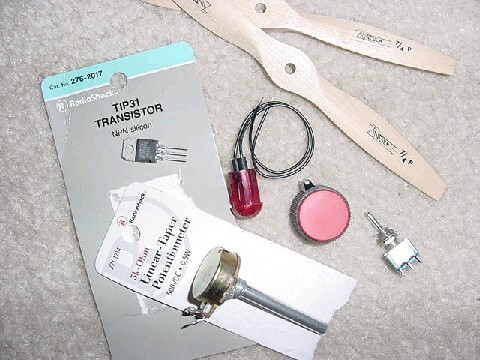 What you will need is one 1k or 5k Ohm Potentiometer, one TIP31 Power Transistor in a TO220 casing, an indictor LED so you know power is going though the transistor, some sort of switch, and some wire. 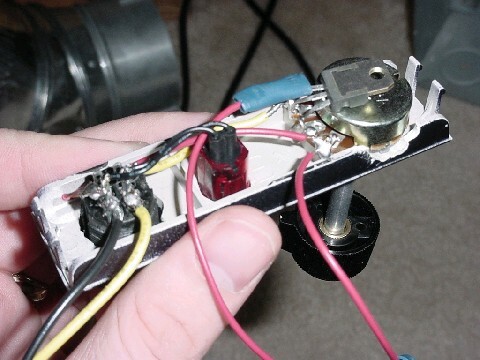 The purpose of the transistor is because I could not find a Potentiometer that could take 32Watts. I found this out the hard way! 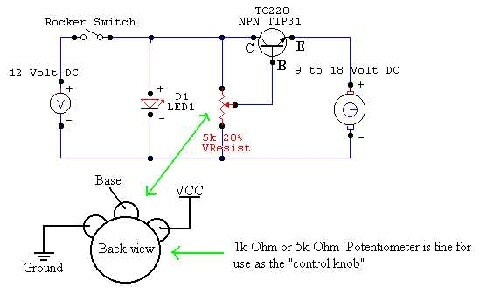 The incoming 12 volts should connect to the collector of the transistor and the right most connector ring on the potentiometer (look at it from behind, control knob pointed away from you.) The middle ring of the potentiometer connects to the Base of the transistor. 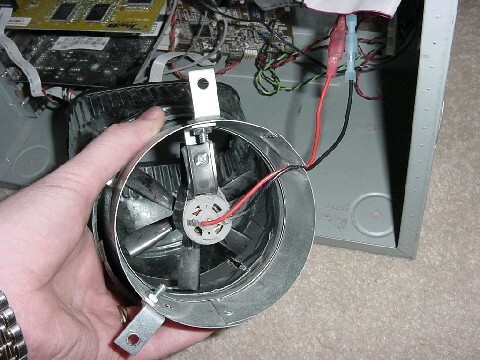 The Emitter should be the power to your fan motor. 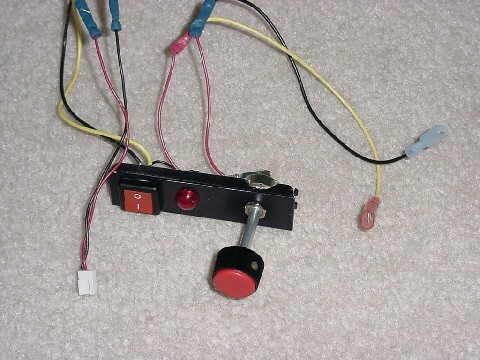 The left most connector on the potentiometer, the ground from the motor, and the ground from your LED should all be connected to the -12 Volt lead (Negative or ground black wire). 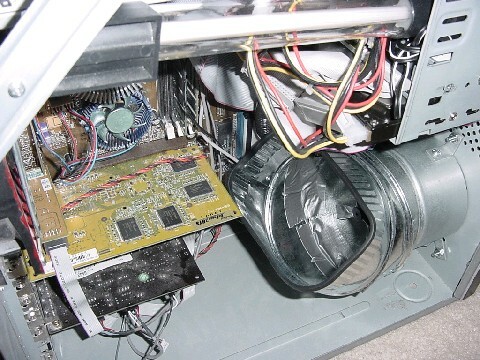 If you have a spare 12 volt case fan jumper on your motherboard, you can use that as your main source of ground and power. Just follow the diagram I have attached and wire everything CORRECTLY and you should be fine. If you screw up you will notice a little smoke from your circuit! 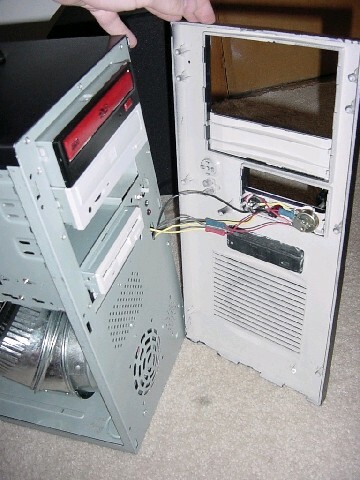 LOL Don't worry, the only way to hurt your motherboard or power supply is if you shorted +12 volt directly to ground. That would be bad! Make sure you connect your LED in parallel with your circuit, not serial or your LED will act like a resistor and your fan will not blow at all!